Millions of products all over the United States use barcodes. Standard UPC barcodes help businesses throughout the supply chain to track and monitor their own products and those of partners, ensuring everything gets to its intended destination on time. 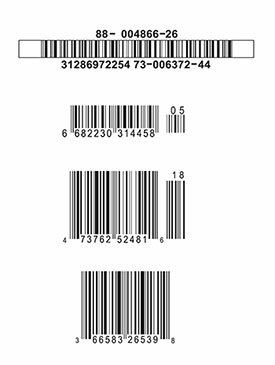 Bar codes are especially important for perishable items, although they are used throughout retail. Many vision systems professionals have some interaction with barcodes, but not everyone knows all the details behind how they work. Let’s take a closer look at barcodes, the unsung hero of so many common logistical challenges. UPC stands for Universal Product Code, a standard for encoding key information about all kinds of products. UPCs were originally used in groceries, intended to accelerate the checkout process by making pricing and other information visible to point-of-sale systems. Although UPCs are ubiquitous, they aren’t the result of federal or international regulations. Instead, they are administered by a private company, the Uniform Code Council. Each and every manufacturer that uses unique UPCs for its products pays an annual fee. The manufacturer ID – which the annual fee pays for – is the first part of every human-readable code assigned to a brand. It takes up six digits and is followed by a five-digit code that denotes the individual product. The last digit is a “check digit,” the result of an algorithm that helps ensure each product is scanned correctly at the cash register. UPCs are vital to today’s convenient point-of-sale environment, but they also have some quirks you may not know about. For example, the Uniform Code Council doesn’t actually assign specific digits to products: That’s the job of an inside expert called the UPC coordinator. Businesses with lots of SKUs may actually spend hundreds of hours keeping all their UPCs up to date! Since UPC codes are highly standardized, reader software does not need to be designed with a wide range of variations in mind. However, codes can still become unreadable if they have not been printed according to appropriate standards. Even a code that seems flawless to the human eye might not be sufficient for scanning, especially in a fast-paced environment. When print quality is high, proper lighting is still essential – and the scanner must cross all bars in the code. Poor device calibration can cause scanning to fail even when all other factors are ideal. Machine vision software and technology helps ensure that barcodes are working.